CHICAGO – A new poll released today by the Property Casualty Insurers Association of America (PCI) highlights the need for more parents to discuss the greatest dangers young drivers may be facing – distracted driving, lack of seat belt use, speeding, impaired driving and extra passengers. 2. Buckle Up. Every Trip. Every Time. Everyone—Front Seat and Back. 3. Eyes on the Road, Hands on the Wheel. All the Time. Remind your teen that drinking before the age of 21 is illegal, and alcohol and driving should never mix, no matter your age. 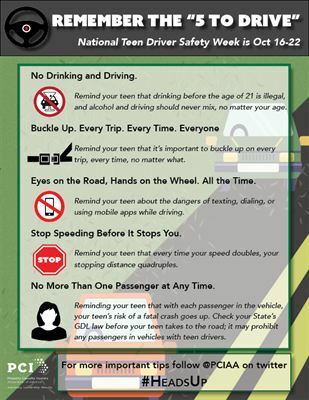 Check your State’s GDL law before your teen takes to the road; it may prohibit any passengers in vehicles with teen drivers. Over the past two years the roadways have become much more dangerous. Data from the National Highway Traffic Safety Administration shows that motor vehicle crashes, the leading cause of deaths for teenagers in the U.S., jumped more than 10 percent since 2014. 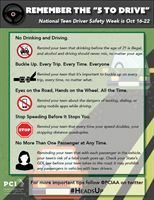 Parents need to set a good example and educate their loved ones to put the phone down and pay attention to the road.